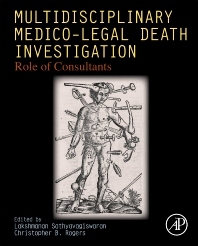 Multidisciplinary Medico-legal Death Investigation: Role of Consultants is the only book in the field that focuses on the role consultants have in medical examiner/coroner offices. The book provides a multidisciplinary view on the topic by including specialized fields, such as anesthesiology, surgery, radiology, including CT scan, pediatrics, cardiology-electrophysiology, cardiac pathology, forensic anthropology and odontology, firearms examination, firearms, eye pathology and psychiatry/psychology. Coverage also includes chapters on specialized topics, including high profile cases, the media, business continuity planning, envenomations, the importance of quality assurance and peer review, and quality assurance in a medico-legal death investigation office. This one-of-a-kind resource is ideal for those in the medico-legal death investigation field and professionals in the criminal and civil justice system. Dr. Sathyavagiswaran is a medical graduate from Stanley Medical College, Madras University, India. He is a 30 plus year veteran of the Los Angeles County Coroner's Office, and was appointed as Chief Medical Examiner-Coroner (CME-C) for Los Angeles County on February 18 1992 by the Board of Supervisors, who also appointed him to the position of Director in 2012 and he retired from his position in 2013. He is a Board Certified Physician in several specialties including Anatomic, Clinical & Forensic Pathology, Internal Medicine, Geriatric Medicine and Infectious Diseases. He is also certified in pathology by the Royal College of Physicians and Surgeons of Canada. As a peace officer, he holds a specialized law enforcement executive certificate from the Commission on Peace Officers Standards and Training, State of California. Dr. Sathyavagiswaran is a Clinical Professor of Medicine and Pathology at Keck School of Medicine USC and has numerous publications to his credit. Dr. Christopher Rogers received his MD degree from the University of California, San Diego. He did pathology residency at LAC and USC Medical Center, and forensic pathology fellowship at Los Angeles County Coroner. He is board certified in anatomic and clinical pathology, and in forensic pathology. He has worked at Los Angeles County Coroner since 1988, and has been the chief of forensic medicine since 1992. He was acting chief medical examiner-coroner to Los Angeles County from January 19, 2017, through July 09, 2017. He also holds an MS degree from California Institute of Technology and an MBA degree from California State University in Los Angeles. He has numerous publications to his credit. A MUST READ FOR ANY PHYSICIAN OR CURIOUS INDIVIDUAL. CONCISE /THOUGHT PROVOKING WITH REAL CASES . TO HELP THE FUTURE,SOLVE THE PAST!THE AUTHORS AND CONSULTANTS ESPECIALLY DRS.SATHY/ROGERS/ASTARITA ENCOURAGED COMBINING THE FACTUAL /INDIVIDUAL EXPERIENCE AND KNOWLEDGE FOR INTELLECTUAL DEBATE AND DISCUSSION! VARIED INTERESTS AND WELL DONE!